Once just mysterious foam logs, foam rollers are now mainstays at clinics, studios and gyms. However, even veteran users may not know the foam roller's full potential. Yes, foam rollers are the ultimate self-massage tools, efficiently releasing trigger points and easing post-exercise soreness. But they are so much more. Foam rollers challenge core stability and balance, improve posture, deepen mind-body exercise, and offer a one-of-a-kind Pilates experience. START YOUR PRO-ROLLER™ EXPERIENCE WITH THESE DIVERSE TECHNIQUES. Integrates core, upper body and lower body; strengthens core. On your hands and knees, with upper shins on the roller. Arms under shoulders, spine aligned. To prepare—inhale; breath expands three-dimensionally. Exhale. Engage abdominals and flex your hips to pull the knees and the roller in toward your chest, curving your spine. Inhale. Extend your hips to return to the starting position. Strengthens core; trains sequence of upper body flexion. Lie on the roller, aligned spine. Knees bent, feet hip-width apart, hands behind head with elbows reaching out. Exhale. 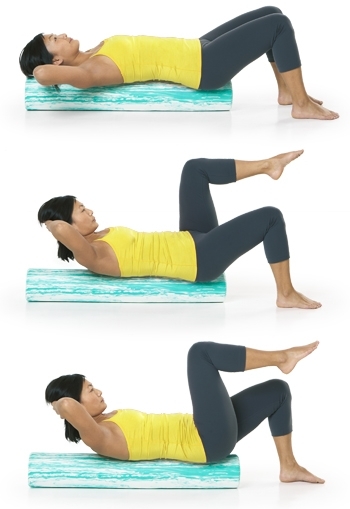 Abdominals activate as you curl your upper body off the roller to your middle back, sliding the ribcage closer to the pelvis while keeping your pelvis level. Simultaneously lift one knee toward your chest. Inhale. With abdominal support, slowly lower your upper body back down to the roller and return your leg starting position. Repeat 8-10 times, alternating legs. Sitting on the roller, knees bent, arms supporting on the floor behind roller. Lean to one side and place that ankle on the opposite knee; rotate your hip outward as much as is comfortable and angle your knee down toward the floor. Roll on buttock, relaxing and releasing the deep hip rotator muscles. Pause on tender regions for a few breaths, softening and melting with each exhale. These exercises, and many more, are available with detailed instruction in the PRO-ROLLER guides, by Angela Kneale, OTD, OTR/L.